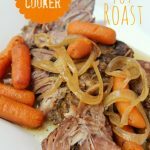 A fall apart, delicious, slow cooker roast you can prepare in minutes and let cook all day until you’re ready to enjoy! In a large saucepan, brown the roast in the olive oil (about 1 minute per side). Place the sliced onion and mini carrots in the slow cooker. Place the browned roast on top of the onion and carrots. In a small bowl, combine the dry mixes, warm water and beef broth until well blended. If you’d like to cook the roast faster, set the slow cooker to high for 4-5 hours.